calypsosystems « Calypso Systems, Inc. This below is an excerpt of a recent white paper authored by Calypso Systems CEO, Eden Kim and published by SNIA SSSI. 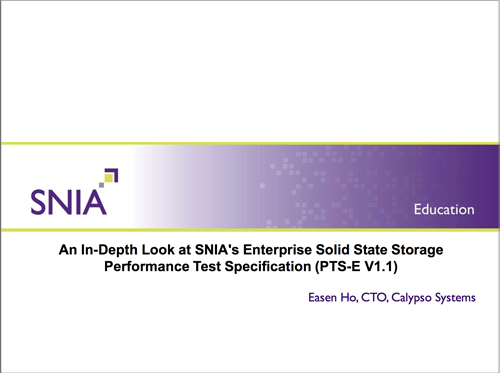 The below measurements were taken by Calypso Systems, Inc. on the SSSI RTP/CTS test platform pursuant to SNIA Solid State Storage Performance Test Specification version 1.1. How does one use the PTS to evaluate and compare SSD performance? First, data should be collected by using the SNIA PTS on an SSSI Reference Test Platform (RTP) to get standardized and normalized results. The user should then select the key measurements from each of the three metrics (IOPS, TP and LAT) to compare the overall performance. There are commonly accepted block size and RW mixes that are used to evaluate SSD performance. 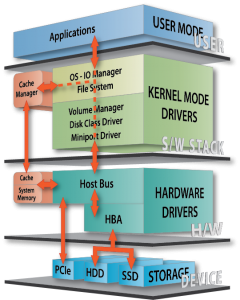 While users may have an interest in other specific access patterns, industry convention uses device level “corner case” (or boundary) testing to evaluate SSD performance (see Appendix – Test Practices). 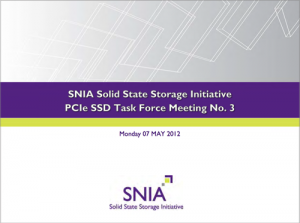 While IOPS, TP and LAT have long been used for the testing of HDDs, the SNIA PTS methodology has added solid state storage specific processes to accommodate the uniqueness of SSD performance. Specifically, the PTS defines a standardized Pre-conditioning and Steady State determination to ensure the SSD is properly prepared as well as SSD specific tests that address SSD specific performance behaviors. 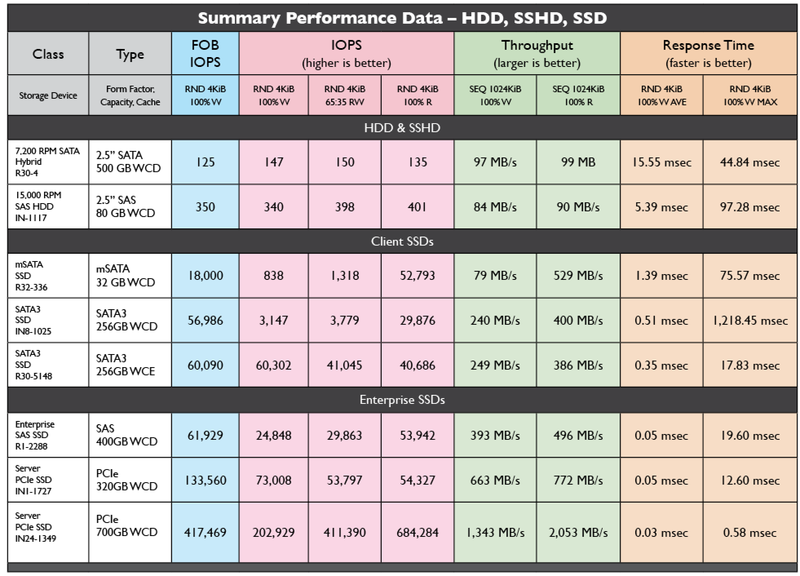 The chart above shows summary performance data for HDD, Solid State Hybrid Drive (SSHD), mSATA, SATA, SAS and PCIe SSDs. In this chart, there are four measurements for IOPS, two for TP and two for Response Times. This provides an overview of overall performance. Of course, different access patterns can be selected for summary view. 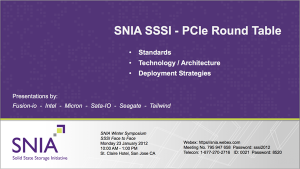 SNIA announced the update to the Enterprise Performance Test Specification (PTS-E 1.1). The draft is available for public review at www.snia.org/publicreview. SNIA SSSI also announced an updated Reference Test Platform (RTP) www.snia.org/forums/sssi/rtp and a recommends testing services thru their certified PTS testing facility www.snia.org/forums/sssi/ptstest – Calypso Systems, Inc.
Dr. Easen Ho tutorial previews PTS-E 1.1 test methodologies during the 2012 Fall SNW at the Santa Clara Convention Center, Santa Clara, CA. Kickoff of new Task Force. 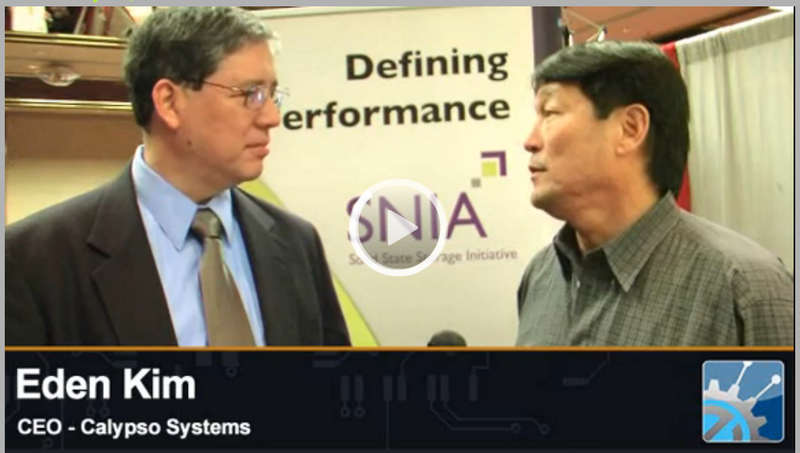 Bill Wong interviews Eden Kim to discuss the SNIA Solid State Storage Performance Test Specification at Storage Visions 2012.